Habitat fragmentation is one of the most pervasive and difficult-to-control threats to native ecosystems in Pennsylvania, the Northeast, and worldwide. It occurs when other land uses break up large contiguous blocks of habitat into smaller patches or when roads, transmission lines, pipelines, or other corridors penetrate blocks of habitat. These corridors do not necessarily isolate patches of habitat but do compromise the integrity of the habitat interior. Habitat fragmentation can have negative effects on wildlife and ecosystems through direct habitat loss or indirectly through changes that occur as a result of the adjacent habitat type and the particular land use associated with it. Although fragmentation can occur in any habitat type, in Pennsylvania concerns are associated primarily with forest habitat. Habitat loss and fragmentation are direct byproducts of natural gas exploration and development, which has been increasing exponentially since 2008, when it became technically and financially feasible to recover the gas found in the Marcellus shale formation. As of August 31, 2013, nearly 7,000 deep wells have been drilled into the Marcellus formation on more than 1,000 pads. Approximately half of the pads have gone into forest habitat, and half of those have gone into core forest ((forest > 300 feet (100 m) from a preexisting road or opening). Each pad is on average 3–6 acres and is associated with pipelines and roads that cumulatively have the potential to fragment Pennsylvania forests. For example, current predictions suggest that as much as 60,000 new miles of pipeline will be developed in Pennsylvania to transport the gas from its origin to market. 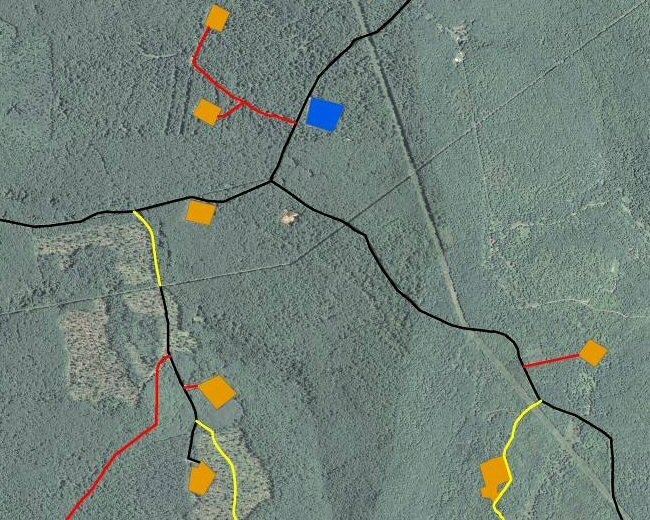 Companies are encouraged to place pipelines adjacent to preexisting roads, but this is not always possible, and many miles of new pipeline bisect forest habitat. Habitat fragmentation concerns include direct loss of habitat associated with the well pad and also direct and indirect effects resulting from the pipelines, roads, and other disturbances associated with the well site. This is of particular concern because the Marcellus shale formation covers much of the Allegheny Plateau region, which encompasses Pennsylvania’s largest block of contiguous forest. It is also the location of much of our public lands, which have played an important role in providing habitat for wildlife, a venue for recreational opportunities, and a timber supply. The effects of fragmentation are complicated. They vary with the size of opening (larger openings produce greater fragmentation effects), the type of opening (permanent openings are more detrimental than temporary openings), and the surrounding landscape. For birds, fragmentation effects are most notable in landscapes that are about 45—55% forested. With less forest, the entire landscape tends to be fragmented and species that depend on larger tracts of habitat have already been eliminated from these areas. In areas with > 90% forest cover, generalist species that thrive in disturbed habitats are typically rare in the region, so they are initially less available to use the openings and edges, which reduces the potential for negative edge effects. For plants, the probability of invasive species moving into the forest (a major fragmentation concern) depends not only on local disturbance but also on characteristics of the surrounding landscape (invasions are more common in human-dominated landscapes than wilderness areas) and how the land was managed in the past. In the sections that follow, we discuss the values of core forest habitat, concerns associated with fragmentation, outcomes of fragmentation, and mitigation measures to reduce fragmentation effects. Additional recommendations on ways to minimize fragmentation can be found below (Table 1: Mitigation Measures). Why is Core Forest Habitat Important? Core forest habitat has been defined in various ways. A general operational definition is forest habitat farther than about 300 feet (100 m) from any nonforest edge or opening. Because many species are found primarily within core forest or reach their highest abundance within core forest, this habitat type is very important. For example, the diversity of Pennsylvania mammals is highest within core forest in the northcentral region of the state, and hot spots of species richness were associated with large forest patches and low road densities. Pennsylvania is home to a number of forest songbirds that are known as area-sensitive or forest-interior species because they reach their highest abundance within these core forests. For some of these species, Pennsylvania is a keystone state providing habitat to a significant proportion of the population. For example, more than 19% of the global population of scarlet tanagers (Piranga olivacea) and 9% of the global population of wood thrush (Hylocichla mustelina) breed within Pennsylvania forests. From a regional and global perspective, Pennsylvania plays an important role in maintaining populations of these and other forest-dwelling species. Consequently, many of these species are classified as responsibility species by the Pennsylvania Game Commission, emphasizing the importance of Pennsylvania forests to these species. Our large forests are also important for outdoor recreation and for maintaining the forests’ wild character and the associated wilderness experience. Fragmentation results in both a quantitative and qualitative loss of habitat. There is the direct loss of forest habitat as forests are cleared for pads, pipelines, and roads, but there is also a qualitative change as the amount of forest in close proximity to an edge increases and the amount away from an edge declines. This increase in edge is associated with a number of changes at multiple scales. Increase in edge and decrease in core forest–Historically, edge habitat was considered to be beneficial for wildlife because many of our game species use a mosaic of habitat patches or reach their highest abundance near edges, and there is often a greater diversity of wildlife near edges. However, this increase in diversity and abundance of some species and the shift in species composition also has a negative side. We know the most about how fragmentation of contiguous blocks of forest habitat affects forest-dwelling neotropical migrants. For a variety of reasons, nest predators that feed on eggs and nestlings, and brown-headed cowbirds (Molothrus ater), an obligate brood parasite that lays its eggs in the nests of other species, tend to be more abundant close to edges and openings than within the forest interior. As a result, songbirds nesting near edges and openings are much less likely to successfully raise young than individuals that nest away from edges and openings. As fragmentation increases, there is less forest interior and more forest edge. As a consequence more individuals nest near edges where nest success is low. Fewer young are produced and eventually populations decline. Species that depend on early successional (young) forest habitat, such as regenerating clear-cuts, small forest gaps, or small herbaceous openings, are often assumed to be species that would benefit from fragmentation. However, this is often not the case. Many early successional species are also “area-sensitive” or “interior edge species,” meaning that they require large blocks of unfragmented habitat at a landscape scale. For example, the Appalachian cottontail (Sylvilagus obscurus), a species of conservation concern in Pennsylvania, is associated with thickets and brushy habitat located within a larger forest landscape. They are generally rare or absent from brushy habitat within a fragmented landscape. Ruffed grouse (Bonsa umbellus) are associated with small openings and narrow forest roads within larger forested landscapes. These forest edges are beneficial for grouse broods because herbaceous cover, insect abundance, and sapling density are typically highest along these edges. However, as the forest is fragmented by new roads and pipelines, the habitat also becomes more suitable for predators, and predation is a major cause of chick mortality. A Pennsylvania study found that grouse survival decreased as the number of roads in the landscape increased. As a general rule, fragmentation from roads and pads will tend to favor generalist species over both mature forest specialists (such as the scarlet tanager) and early successional habitat specialists (such as the ruffed grouse). Increase in disturbance– Habitat fragmentation is associated with both short-term and long-term disturbance. In the short term, land is cleared and soil is disturbed, providing access for plants and animals that do well in disturbed environments. In the long term, access to previously remote areas via the new roads and pipelines brings a continual source of disturbance and long-term changes to the area. A number of threats are associated with disturbance. Spread of invasive plant species– Fragmentation has been associated with the spread of invasive plant species. Many invasive species are associated with disturbance. Many thrive on bare soil and disturbed ground where native plants have been displaced. Some invasive species may initially enter forests on vehicles or equipment. Japanese stiltgrass (Microstegium vimineum), garlic mustard (Alliaria petiolata), shrub honeysuckles (Lonicera spp. ), and common privet (Ligustrum vulgare) are all examples of invasive plants found within northeastern forests. Once established, these invasive species can outcompete or make conditions unsuitable for native species such as trillium and other spring wildflowers in Pennsylvania’s forests. Disturbance of sensitive habitats and species of conservation concern– Roads, pipelines, and pads often damage sensitive habitats such as vernal pools and spring seeps. Although we have laws to protect wetlands, many of these wetland-associated habitats are difficult to detect and are thus often damaged during development. Species of conservation concern, including our threatened and endangered species, are by definition rare with very limited distributions. Any disturbance that directly affects them or affects critical habitat on which they depend can have cataclysmic effects because the populations are so rare to begin with. Increase in traffic and human access– Natural gas exploration and development is associated both with new and expanded pipelines and roads and with increased vehicle activity along the roads. Roads of all types have a negative effect on wildlife through direct mortality, changes in animal behavior, and increase in human access to areas for hunting, fishing, and other activities. Marcellus industry roads are generally much wider than typical forest roads to support the heavy truck traffic. Drilling and preparing a Marcellus site for hydraulic fracturing requires approximately 1,000 truck trips. Even after a well is drilled and completed, new roads and pipelines provide access for more people, which results in increased disturbance, hunting pressure, and the loss of the forests’ wild character. Barriers to dispersal and avenues for invasion– Pipelines and roads form linear corridors that can act as barriers to movement for some species and avenues of invasion for others. For example, pipelines and roads function as barriers to dispersal for many amphibian species and some small mammals. Pipelines can act as avenues for invasion for species such as brown-headed cowbirds, which are generally absent or rare in forest habitat that lacks openings, and can serve as travel lanes for nest predators such as raccoons (Procyon lotor) and fox (Vulpes vulpes, Urocyon cineroargenteus). As fragmentation occurs, there is a shift in species composition, with some species benefiting from it and other being harmed by it. As a result, you see shifts in species composition with winners and losers. Winners tend to be habitat generalists that use a mix of habitat types, are tolerant of disturbance, and can coexist with people. Examples include mammals such as the raccoon, opossum (Didelphis virginiana), and white-footed mouse (Peromyscus leucopus) and birds such as the blue jay (Cyanocitta cristata) and American crow (Corvus brachyrhynchos). Wildlife losers include species such as forest hawks that tend to be intolerant of disturbance; groups such as salamanders that have poor dispersal abilities; area-sensitive or forest-interior songbirds; early successional habitat specialists; and species that are already rare or have very limited distributions, such as the timber rattlesnake (Crotalus horridus), Allegheny woodrat (Neotoma magister), and northern flying squirrel (Glaucomys sabrinus). This shift in species composition is a concern because there is a tendency to lose species that are rare, unique, or specialized to exist in that particular habitat type and replace them with species that tend to be wide-ranging and common both in Pennsylvania and elsewhere. We risk losing the unique composition of species that makes Pennsylvania forests what they are today, and we risk losing many of the species that are currently species of conservation concern in Pennsylvania. For additional information on Pennsylvania species of conservation concern see Pennsylvania’s Wildlife Action Plan. A question that often comes up is whether the edges and new habitats created through fragmentation can be beneficial for some of our game species such as white-tailed deer (Odocoileus virginiana) and wild turkey (Meleagris gallopavo). The answer will depend on the type of edge habitat and how it is managed. Whether an edge habitat is good or bad for a species depends on characteristics of both the species in question and the type of edge. If the edge or the new habitat provides a resource that is used by the species and is either not available or is in low supply within the forest, it can be beneficial. For example, depending on how it is configured and seeded, a pipeline or a restored pad could provide foraging habitat for turkey and deer. On the other hand, a pad covered in stone would not provide any resources for most wildlife species so would not be beneficial. Large and expanded roads also would not provide a beneficial edge. In some situations, animals may be attracted to an area because of the type of habitat provided, but either their survival or the survival of their nests or young is poor in these areas because of the predators that are also attracted there. This is termed an ecological trap. One of the goals of management is to manage pipelines and restored pads so they provide habitat without becoming ecological traps. This means that there are opportunities for positive benefits for some species depending on when and how the areas are reclaimed and managed and the level of human disturbance in the area. For additional information, see Restoring for Wildlife and the species-specific accounts within this field guide. Mitigation measures to reduce fragmentation associated with oil and gas exploration and development include avoiding additional fragmentation up front by concentrating disturbance near pre-existing edges or openings, using methods for seismic surveys and site development that minimize disturbance, using revegetation as a means of reducing current fragmentation, establishing a monitoring program to track potential problems associated with fragmentation, and directly managing potential problems such as increased levels of disturbance and spread of invasive species (Table 1). Table 1. Mitigation measures to reduce habitat fragmentation issues associated with natural gas exploration and development (adapted and expanded from Albrecht, S., R. Hinkle, and E. Nathanson. 2000. Direct relevance to the natural gas industry of the habitat fragmentation/biodiversity issue resulting from the construction of new pipelines: topical report. Gas Research Institute. Program Management Division, Pipeline Program. URS Greiner Woodward-Clyde).